Covered by US patents #6,136,339 and #6,100,287, Creakic is the world’s first and only muscle receptor hyperactivator. Muscletech Creakic is molecularly engineered formula was designed with a specific purpose in mind: to offset the destructive effects of reactive oxygen species (ROS). This results in explosive gains in muscle size, strength, and performance. Before my first cycle of Creakic i weighed 135lbs and benched 230lbs. In high school i was about 140 benching 245 but after a year of doing absolutely nothing i dropped alot. After a month of doing the recommending dosage of Creakic and drinking an ample supply of water (5 20oz bottles a day) i weighed 152lbs and benched 270lbs. Not all of it was Creakic but it allowed me to bounce back FAST!! When I first started to work out I weighed a mere 150 lbs. After a few months working out with a friend I put on 10 lbs, then I started to change the routine (a new one a personal trainer gave me for free) and in two months I put on another 5 lbs. I decided to start taking creatine and the guy at the store said he really liked this kind so i bought it, within a couple of weeks I could really see a difference in my body shape and i had put on another 5 lbs in just 3 weeks! I couldn't believe the results and my friend that I used to work out with couldn't either (I'm almost as strong as him now and he used to lift twice as much as me). This product works anyone who says creatine is only water weight doesn't understand how creatine works. Also the cycling if you're getting more than about 5 grams a day is a good idea. However this particular supplement only gives you about 5.4 grams a day and won't do any real damage and unless you're getting creatine from other sources you don't need to cycle unless you want to lose some of the muscle mass you got from creatine in the first place. One thing the guy at the store recommended was to only take 3 pills on the non-work out days and that was all you need to do for the cycling, the bottle lasted me about a month and a half that way too. This is more for Tony from Canada. DO NOT TAKE THIS SUPPLIMENT IF YOU ARENT GONNA GO TO THE GYM AND KICK THE CRAP OUTTA YOURSELF. It is a suppliment that helps to build muscle... not meant to give you stamina. It is designed to be used in the gym... not a ju jitsu competition. Seriously... dont complain about weight gain with this product... do some research on creatine based sups... that is what creatine does... initially it is just water, but after a week or two you will notice fuller, stronger muscles. You should also cycle this sup. Go through a bottle, dont use it for a month, go through another bottle, dont use it for a month etc etc. Your body gets used to it and builds a tollerance to it. It really does work when used correctly, but every body is different. The only real way to tell what works for you is to experiment with different sups... but for me, this stuff works well. Hey this product is no joke as well as other creatine products. I had the powder form of creatine and i gained 15 pounds..some of it water weight as expected, but muscle too. then my older brother had these creakic creatine pills and in about 2 weeks you see the difference. you must drink ALOT of water and follow the directions. IT DOES WORK. I have been on Creakic for a full week now. I weight 162 lbs and was benching 235 lbs max before Creakic. After a week of taking Creakic I tested it out and benched 245lbs. I am also taking Animal Pump. I am going to try a cycle of it hope to gain more on the bench. My goal is to bench 315 lbs and get control my weight to under 165 lbs. Also the reason people cycle it is because your body adapts to it because it is getting its creatine from another source and slows/stops its production.. So people stop using it for a bit so your body starts producing it naturally again then you start your creatine back up. Tony From Canada.... you're a complete moron. I too have been training in Jiu Jitsu for years, but that type of physical activity is NOT what this supplement is for. Its for heavy weight lifting. I seriously hope you're not that stupid. Anyhow, I have had modest gains with this product. No supplement is going to perform miracles, however done properly and with the proper water intake, Creakic works well I feel. First off: "Tony from Canada:" There is a reason it says to take it right AFTER the workout. This supplement works best when the muscles are already broken down! I took this product along with Leukic and Muscle Milk. My weight-lifting friend told me that that was a good combination. I gained 15 lbs. in 3 months! My bench went from 180 to 225 (it's higher now). I've also found that in order for this to work, you can't take it long term because your body gets used to it. I go through a bottle of this and leukic (only take it on work-out days and it last for aobut 3 months) and then I got for a dry month for my body to get back to normal. I tend to lose weight during this month as some water concentration is lost, but as soon as I get back on it, I get the same explosive results that i had the first time instead of steadily declining results. ok for all u noobs, its extremely hard if not impossible to gain results in under a week, and the guy that said 5 pounds in three days or whatever, im sorry to tell you but this is a common effect of any basic or expensive creatine, called WATER BLOATING. creatine can almost be compared to a salt, one that sits in the muscle attracting water into the muscle.so this instant weight gain is just water. along with all this water, the creatine also attracts alot more minerals and vitamins, so after 2 to 3 weeks, usually the muscle starts to respond to the added nutrients and the starts growing. of course with any supplement, inadequite water, proper diet and lack or unprogressive training, its extremely useless and can also be potentially carcenogenic. I have tried this product on two separate occassions immediately before a ju jitsu workout and a competion. The first time I took it I felt overheated and weak, but did not make the correlation. When I took it a second time immediately before a competion I was completely gassed, fatigued and felt overheated to the point of almost collaping. 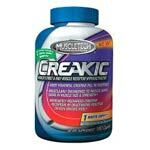 Creakic is one of few creatine substances that I personally have tried. Since taking Creakic, I have gained weight, and increased strength. It is hard to give all the credit to the 'pill' though, you know. You work out and train, any substance is an addition one must remember. I do not take the recommended dosage, but may one day work up to it. It does "get you in the mood", but should creatine have this effect? Maybe I just feel as though it does more than it should, but I have felt heart achs so to say, as I feel it works up my heart like hydroxicut did while I tested that product for a time period. Over all, it is benificial, but what suppliment isn't in some form or another when taken carefully and under caution? I have taken Creakic 3 times as per recommended dose. 1st time Ok, 2nd Time in combo with other musletech pills had an allergic reaction in the form of skin irritation. 3rd time I took Creakic by itself to isolate the side effects of this pill. After 15 minutes I broke out in a severe skin rash, which persisted for about 1/1/2 hours. No more Creakic for me. I'm 28, weigh roughly 274 ibs. 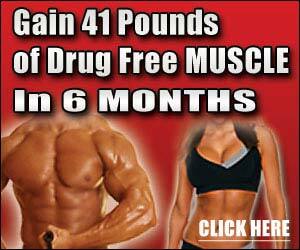 i started taking creakic along with anator p70 and gackic exactly 1 month ago and i weight train 4 days a week. from sept 1st to oct 1st i gained 10 ibs of muscle. chest, up an inch, upper arms up 2 1/2 inches, quad/ham size up 1 1/4 inches, and my calves up just over an inch. that was in 29 days! im very impressed with my turn out. I can alreaady I've added a bit more size since last week. Have only work my shoulders, abs, and jogged but they have all come with a lot more ease. I've been using 95 lbs on the military press with reps of 7-10, now i can knock out 12-15 with a bit more ease. The ultimate test will come when I get under the barbell for benches. I can already tell my chest has pumped up more, and I'm really curious to see the results. I also dont take the 6 recomm. pills a day. Sometime 3, depending on how active I plna to be. Just drink plenty of water, and eat half way decent and you have the potential to gain fairly well on this. If you read contuniously bad reviews, the majority of those people may not have the best diets or workouts put together. Good luck! This stuff gets hyped up by muscle tech so much and it doesn't even work. I tried a bottle and took my servings in the morning and immediately after i lift and seen no gains. maybe only 5 lb. to my bench but i had better gains using cheap whey proteins. I can't believe i wasted my money on this stuff. Im a serious athlete and i wont look to to muscle tech anymore. You'll be sorry when purchasing this bull crap. Creakic is the supplement that you should take after you have developed a certain build. It should be taken on the exact direction of dosage otherwise its useless. I did feel a significant increase in my strength, therfore increasing my reps. Its easy to use and it doesn't have many side effects except an occasional headache, nut overall, if you like MS, get this.